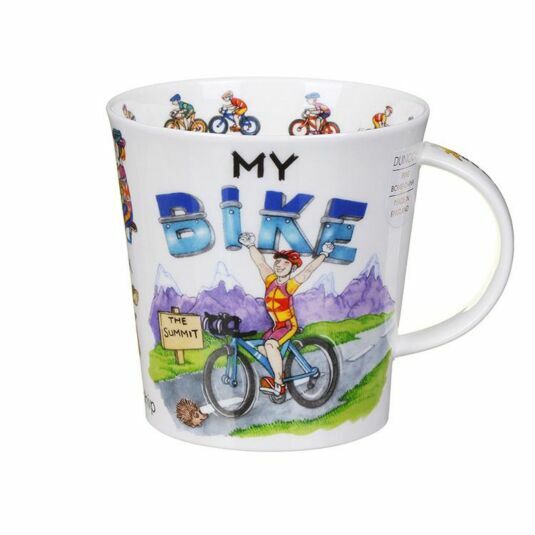 This fun and charming mug which has been designed by Cherry Denman, emblazoned across the top with the words ‘MY BIKE’ in capital letters. This mug feature well-observed characters in amusing scenes with bicycles of various kinds, including a flat tyre and teamwork. The colours are fresh and bright with imaginative and witty attention to detail. The interior of the mug features smiling cyclists, along with an amusing tyre mark and banana down the handle. 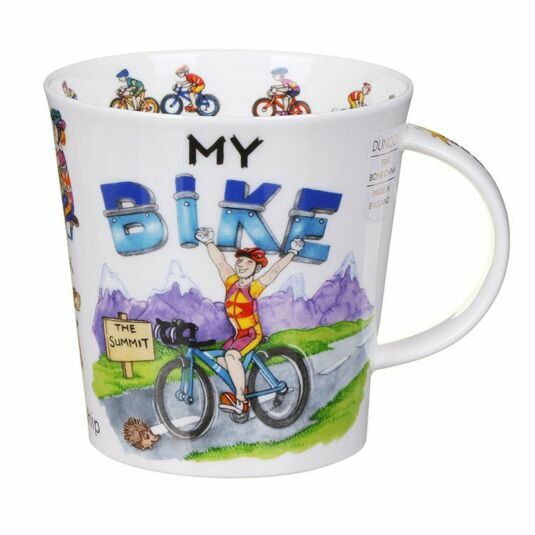 Enjoy a refreshing drink from this mug after an exhilarating ride or put your feet up and enjoy a hot drink instead of getting on your bike! A brightly coloured, amusing design by Cherry Denman, part of a delightful set of mugs which celebrate sport with gentle humour. The 'Cairngorm' shape, named after the Scottish Mountains of the same name, is a larger version of the Lomond shape mugs. It has a gentle slope to the body and a curved handle. With a range of fabulous designs to choose from this 'oversized' mug is a must. With a capacity of 480ml they are both dishwasher and microwave safe, with the exception of any mugs with gold embellishment.